Analyzing classic photographs can be an effective way to progress in one’s own work. The key is not to simply mimic someone else’s great ideas, but to use the knowledge that comes with reproducing the work of masters and move on to create something new. With this in mind, National Parks at Night's Lance Keimig offers this ongoing series highlighting some of the early masters of night photography. We'd love to see any photographs you create after learning more about the pioneers of this niche—please share in the comments section! I grew up in Baltimore and discovered night photography there in 1986. Some of my earliest images—two of which I still regard as decent—were made downtown on West Read Street, just a few blocks from A. Aubrey Bodine’s studio, and where he made many of his best night images. As a Baltimore native son, it was hard not to be aware of Bodine’s photographs and his connection with the Baltimore Sun. I was introduced to his images during a photography class at the local community college early in my career, but I didn’t know that he had made a large number of night images. That’s a discovery I made only quite recently on a family visit to my hometown. Pratt Street and Long Dock, 1959. Bodine began working for the Baltimore Sun newspaper in 1920 at age 14, was promoted to commercial photographer at 18, and became the Sunday Sun feature photographer at 21. He became the photographic director of the Sunday Sun magazine when it was created in 1946. The exposure he enjoyed through his position at the newspaper brought a level of celebrity, and he was well-known and admired as a result. In addition to being employed by the Sun for 50 years, Bodine also exhibited at photo salons both nationally and internationally, and he won many awards. He was made an Honorary Fellow of the Photographic Society of America (PSA) in 1965, as one of the first 20 photographers to be awarded this highest honor along with Edward Steichen, Alfred Stieglitz and Edward Weston. Bodine was a founding member of the National Press Photographers Association (NPPA) and was the first photographer to have a fellowship in both PSA and NPPA. Although he photographed at night between about 1935 and 1960, most of Bodine’s nocturnal images were made in Baltimore around 1950. The Mount Vernon neighborhood was a favorite subject. It’s the location of the Washington Monument, featured in many of those images. He also photographed Baltimore Harbor at night, which is a much different place today after major revitalization that began in the 1980s. Like many night photographers, Bodine learned early on that bad weather makes for great night photos. His night images were made in urban environments with high-contrast lighting, which requires a very different approach than photographing the Milky Way in a national park. He wrote, “Never attempt night photography when the night is clear—always choose a rainy, foggy or snowy night. You will then be able to catch the street reflections and outline the buildings.” That’s good advice for shooting in cities at night, similar to what I’ve been teaching workshop participants for two decades, and something that English photographer Paul Martin figured out way back in 1896. 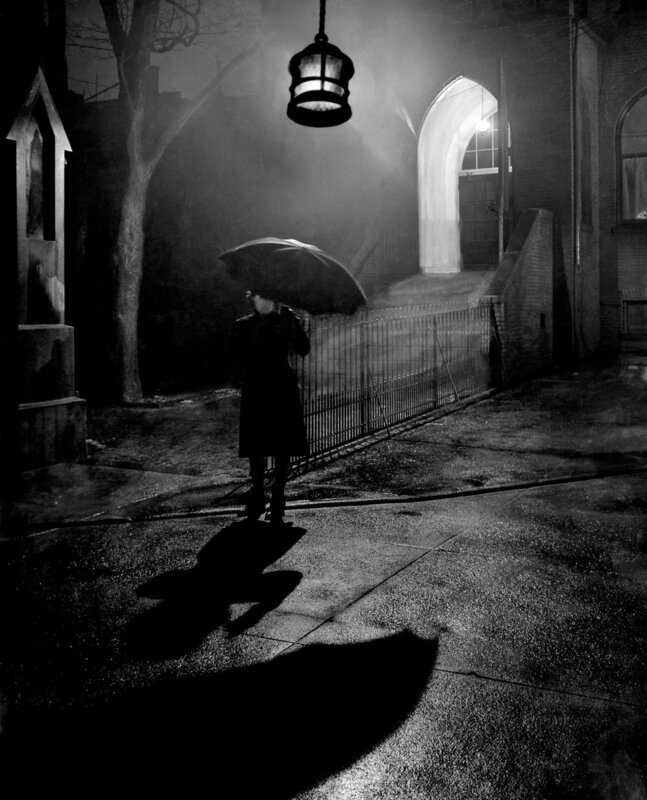 Bodine used a weak developer and an extended development time, the tried-and-true method for controlling highlights in high-contrast night scenes in film photography. The results were often spectacular, even showing detail in the gaslights that illuminated many of Baltimore’s neighborhoods. Excerpts from the Mallinckrodt Photo Bulletin No.71 from 1955, which featured the night nhotography of A. Aubrey Bodine, along with his advice for developing black and white film shot at night. I’ve been fortunate to exchange a series of emails with Jennifer about her father’s work, and she has invited me to meet with her and view firsthand some of his prints and writings the next time I visit Baltimore. Needless to say I’m thrilled for the opportunity, and will report back in a future post. Just the thought has me scheming to pull out my view camera and try to find some of the locations of Bodine’s images. For today’s digital night photographer, one of the most important lessons we can learn from Bodine is that experimentation and breaking the so-called “rules” can lead to solutions to the challenges we encounter in the field. It’s just as true today that trial and error and careful observation of the results is the best way to address the challenges of night photography. Note: To read more about early night photographers, you can read the first chapter of Lance’s book, Finding Your Way in the Dark.